Jeff, 32 is an Insurance agent who owns a Mazda 3 Sedan. He managed to sell his car through Carousell at a good price and made a quick flip to another car in few months. While there are hundreds of cars in the marketplace, he was able to showcase his car with good comprehensive information that his buyers would want to see and gave a competitive price. Carousell is a C2C Marketplace app expanding from South East Asia. The product focuses on casual sellers, like people with a day job or school to de-clutter their space by start selling. I closely worked with Ari, Senior Product Manager, Andrius, The VP of Product and the sweet Smart Listing Scrum team to launch Smart Listings. Special help from Data Science team, Hong Kong Country Team, Vertical Buyer & Merchant teams at Carousell. We wanted to come up with the problem statement that addresses our Buyers, casual and pro Sellers. Carousell listings are simple. Each listing has few photos, simple title denoting what the item is, what's the price, when they posted, what category the item belongs to, and a bit of detail on the item itself and how can the buyers get it. While it worked perfectly well for over last few years, it became increasingly challenging for buyers to find the right item. It was also harder for sellers to keep answering the same question from buyers. They also forget to add some important information in their listings which would make buyers form informed decision fast. Because of these problems, sellers often get basic questions like What's the size, or what's the brand. Carousell as a classifieds app was also entering into properties and cars, and the users we are after will likely be serious buyers searching for high-value items. Comprehensive information for these listings matters more compared to the general classifieds. When we started out with the above problem, we know we need to start with the supply first and improve the listings from there. We often break down our problems to address them faster. In this case, we broke them down to sellers and buyers. Carousell Sell flow always echoed simplicity and it's affordability to list anything very fast. Like mentioned above, the details required to list are very few and there is one single form. The design effectively hides all the steps inside the drill down menus and make the users perceive it as simple. To improve the sell flow, we started with fundamental questions. How might we ask more questions to our sellers without disrupting their user experience? These two questions effectively become our health metrics overall. We wanted to observe the sell-through rate, and the amount of time it takes to sell. My product manager and I profiled few bigger verticals to understand the dynamics of these categories and what information the buyers in these categories look for. We took Cars, Property and Women's fashion as base categories. We then came up with all the possible questions buyers might have and then tried to map it to questions and possible answers. At its core, a category defines what questions we need to ask sellers for the item. For example, if it's women's accessory, then the questions the sellers face will be what's the brand, model, material, size etc, apart from the basic questions like listing title, price and description. This exercise resulted in forming Smart Attribute and values. Value: Values answer to the attribute and they can be one or more. I came with a set of rules and hierarchy for attributes, and this helped me to define a dynamic sell flow, that we can customise for different categories. Once we defined this, we were able to come up with the list of components that would benefit various questions we will be asking for different categories. These components were driven from the server directly and we can enable a new category eg. Smart Speakers under audio and dynamically create a new sell flow with questions tailored to them. 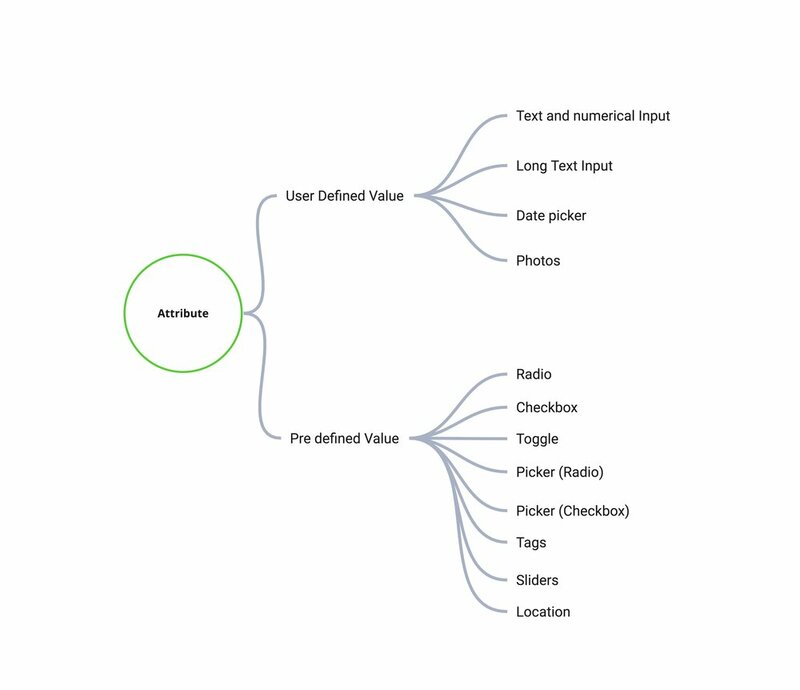 Once we figured the dynamic architecture of attributes and values we are building, we need to define the flow in a way that builds itself based on the category that user picks. The first flow we tried to do was to keep everything as same, and just add more pages Basic Details & Additional Details as part of the flow. The flow involved lot of back and forth and we were worried that it would actually take a lot of time to fill in all the information and users might drop out in the process. The idea involved in user filling two forms, one being all compulsory fields and another being optional fields related to the item. The flow was imagined as the extension of the current flow. We moved from this idea to more straightforward and simpler approach. I tried a sequential step flow with counters to show the progress of the flow. We found that sellers actually take considerable time to pick the right category for their item, and even if they know which category they need to pick. We decided to add a search bar to improve the speed of the listing flow. The Second biggest concern we got from long-term carousell users (including our founders) was our intent to move description field to the last step as an optional field. We all felt description tells us a story about the listing and moving it away would make us similar to the endless e-commerce companies. We kept what was exciting with the previous approach and still tried to make the flow look simple and compact. We arrived at a solution where sellers can list their item with just basic details and add additional details after they finish the flow. Intent to sell → Select / Take Photos →Choose (Search Category) → Add details → List → Add more details and share. This time the feedback was from the Engineers, and the concern was that to maintain the state of adding additional details after the item got listed would be taking more time than we can commit. The Second issue was the context of questions itself. The initial assumption is that the questions we might ask sellers will be separated into compulsory and optional ones and optional ones come at the last step. But because these questions might be related to each other or easier for sellers to fill in contextually regardless whether they are optional or not. With these consideration, we iterated the flow a bit and dropped few steps and arrived at the flow which is close to final and exist inside Carousell today. We decided to validate the flow with a prototype in one of our strong markets: Hong Kong. The intent was to test the new sell flow to discover the usability and flow issues. We got hundreds of people interested in talking to us and we spent few days refining the users we want to talk to. For this test, we want to speak to Non-English users, Users who are currently employed and has sold few items in the past. We also want to understand how smart fields would work in a bi/tri-lingual market like Hong Kong. Some users were worried about filling in information that is Cantonese because they feel they can't reach to Non-Cantonese speakers. We decided to iterate and iron out few most crucial things after the user testing. Our Data Science team came up with Deep Machine learning network which identifies photo and suggests the categories they belong to by studying our current listings. 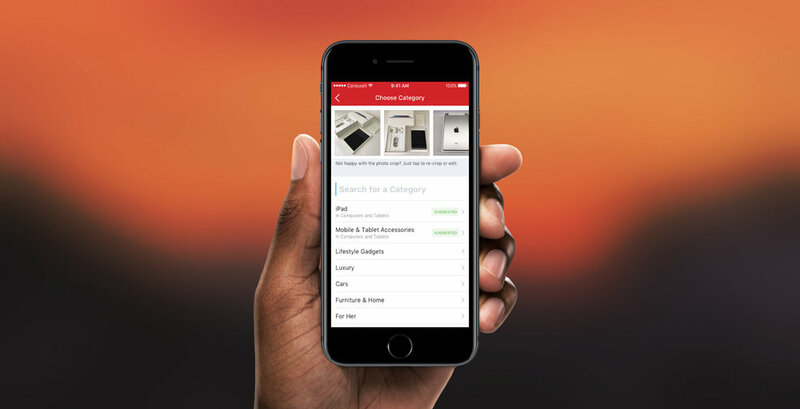 We know this could potentially be a solution that aids our category search experience, but we were not sure how accurate this would be, as we don't want to make wrong decisions for our sellers. The result was to add two suggested categories in the top that's made from the deep convolutional neural networks. Naturally, this sped up our listing process and also made our sellers worry less about categories altogether. We also polished the gallery picker to be more guided as it's the first step for our users when they tap on the sell flow. We first launched the new sell flow in Singapore market to see how it's performing. The Test showed that health metrics are intact and the new flow is not costing people too much time to list, and in some cases, less time to list. The new flow didn't affect sellers from dropping out of selling either. We slowly rolled out to other markets. This was the final validation that the new sell flow is solving user and business problem together and there are lots to improve. A Sneak peak of the flow 6 months after we shipped in the right. Disclaimer: All the content and design ideations are representations of how I see the problem and not directly or the only way Carousell sees. Carousell App and Carousell's logo are copyrights of Carousell PTE. LTD.